I’m a sucker for pom pom fringe! The cute, quirkiness of it just tugs at my heart strings 🙂 It’s not the easiest trim to work with, but with a few tips anyone can do it! 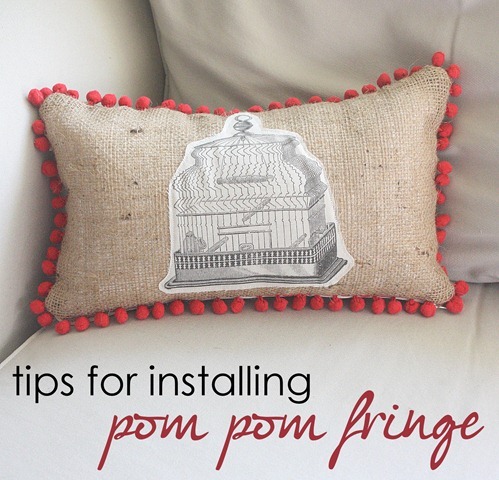 I always start pom-pom fringe in the corner of a pillow. Using my zipper foot, I stitch right along the top of the trim. When I get to the corner, I make sure my needle is down, then turn the corner to go around to the next side. Since this fringe is fairly flexible, it’s easy to get into the corners. I go all the way around the edge of the pillow, making sure the balls of the fringe are facing the right side of your pillow front. When you get back to the first corner, just wrap around one last time and stitch it down. If you have too many balls, just snip them off to get it even. Now it’s time to put on the back. Sandwich the trim between the front and back, then stitch inside the first seam you made to attach the trim. It’s easiest to see if you flip over and use the backside of the first stitches as a guide. I inset my stitches about 1/4 of an inch or so inside the original stitch line. When you stitch all the way around, turn it out and you should only see the cords that attach to the poms and none of the trim that holds it together. It takes a little patience to get it just right – remember practice makes perfect! Want to learn how put the graphic on? Scoot on over to Graphics Fairy DIY for the tutorial! Very cute, love pom pom fringe. Ta! i’ve seen your tutorial via pinterest, it’s great, thank you, i always have trouble with those cute little pom poms but i love them.